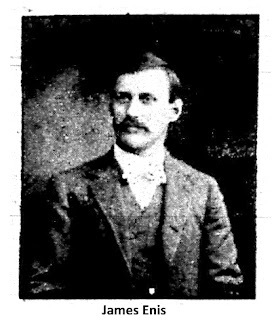 James M. Enis, a republican, was first elected to the office of sheriff of Nodaway County for 1901-1902, and again for 1903-1904. During his terms of office, his father, Francis A. Enis, of Clyde, and one of his five sisters, Miss Belle Enis, resided at the jail with him and helped in the duties of caring for and feeding the prisoners. After successfully completing his second term of office, Mr. Enis went into business, opening a general store and operating it successfully until his death, at the age of 49, from complications following surgery at St. Joseph hospital. Sheriff Enis was related, by marriage to another Nodaway County sheriff, T.J. Parle. Sheriff Parle's wife and Sheriff Enis' wife were sisters. Sheriff Enis would later be appointed at a steward for the State Hospital No. 2 at St. Joseph by Governor Hyde. He would, however, withdraw from the appointment, citing his duty to care for his mother-in-law, who was ninety years of age and who lived with him and his wife. He did not want to disrupt her "beautiful" home life.